Just a week ago, Spain-based phone manufacturer Doogee announced the S60, a mostly-unremarkable durable phone. The best part about the device was the accompanying press release, which was filled to the brim with hilarious spelling errors. Doogee just unveiled the 'Mix 2,' and the announcement is almost as entertaining as the S60's. With taglines such as 'To a wider world" and "Minimal bezels, maximal views," the Mix 2 is somewhere between an LG G6 and a Galaxy S8 in regards to design. There's a 1080x2160 18:9 (presumably LCD) display, a MediaTek Helio P25 processor, 6GB of RAM, 64GB of expandable storage, and 4,060mAh of battery capacity. The press release says "Despite the fancy new techniques in DOOGEE MIX 2, it is still a flagship." I'm not quite sure what that means. Doogee says the Mix 2 is the first Android phone "using face recognition to unlock the full display." I'm not sure what the company means there, considering Android has had face unlock (albeit a very basic form) since Ice Cream Sandwich. Unfortunately, like many recent phones, the Mix 2 doesn't have a headphone jack. There's an adapter in the box, "in case you are getting used to the usual headphone." If you can't wait to buy one, you'll be happy to know that it's "not far away from getting into the market." 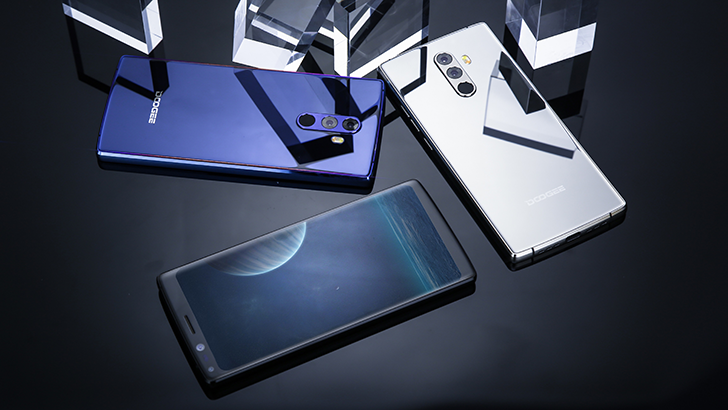 More information about the Mix 2 is available from Doogee's website. Sadly, there is no Game of Thrones Edition available, like the S60. HONG KONG, Sept. 28, 2017 /PRNewswire/ -- DOOGEE is leading the trend of full display smartphones, again. After launching the popular DOOGEE MIX in June, here comes the even greater upgrade, the DOOGEE MIX 2. Besides the 18:9 full-display screen, there are still many impressive features in this up-to-date device. Many tech reviewers and reporters have noticed this new product and posted news or previews about it, which implied that it would be a competitive player in this year's full display contest. Display techniques: more than "full"
First of all, DOOGEE MIX 2 is a qualified, even excellent "full display" smartphone. It applied a 5.99" display in the slim body. Instead of the "big chin" in xiaomi mi Mix 2, or the wired "fringe" in iPhone X, DOOGEE MIX 2 chose the similar design like Samsung Note 8, which achieves balance in the top and below. Keeping the "head and chin" also means that the front cameras, receiver and other sensors can be put at their best position. With the 18:9 aspect ratio, the display of MIX 2 is following this year's trend. Therefore, the resolution of MIX 2 gets a stunning 1080*2160 FHD+, which is definitely clear and colourful. To get a larger area of display, the corners of display are curved. Details like this also make DOOGEE MIX 2 a refined piece of art more than a product. First full display phone with four cameras in the world, 130° wide-angle selfie camera. DOOGEE never fail to apply new techniques into their products. Just as they put dual cameras in DOOGEE MIX, they put four in MIX 2 this time. Dual cameras are getting more and more common this year, but with 16.0MP+13.0MP and the ArcSoft camera optimization, the dual rear camera in MIX 2 won't disappoint you. So let's talk more about the front dual cameras. MIX 2 has two front cameras closely lined up in the top of the body, one for selfie, another for wide-angle weife. The selfie camera is the same as usual one, 8MP resolution with an 88° angle. But the wefie camera is a very impressive part because of its 130° wide-angle. With such a wide imaging area, MIX 2 is able to capture 8 to 10 people in one picture easily. So, maybe it's time to get rid of your selfie stick if you have the MIX 2. The Face ID of iPhone X gives people one more reason to pay $999 for it, but what if the DOOGEE MIX 2 can do this as well? DOOGEE announced they would apply face recognition in MIX 2 for the first time, which will be operated by the front camera. Since there is no room for the fingerprint sensor in full display devices at the front, face recognition may be a trend of the business. However, this is the first time that an Android smartphone using face recognition to unlock the full display. Considering iPhone X will be available in November, and DOOGEE MIX 2 is coming in October, it may become the world's first launched smartphone with face recognition and full display. Despite the fancy new techniques in DOOGEE MIX 2, it is still a flagship. Powered by MTK Helio P25, the cota-core CPU is powerful when there is 6GB of RAM built-in. The chance of a high-end version applying the latest P23 CPU is large in this winter. The battery of MIX 2 is upgraded, from 3380mAh in the predecessor to 4060mAh now. Moreover, by using USB Type-C port instead of 3.5mm headphone jack, the design of MIX 2 is more simple and minimal. There is also an adaptor provided, in case you are getting used to the usual headphone. DOOGEE MIX is not far away from getting into the market. Actually, it has made its debut in Prague in DOOGEE CEE Regional Conference on 20th September. The real model of MIX 2 has got tons of attention and praise from cooperators and media. 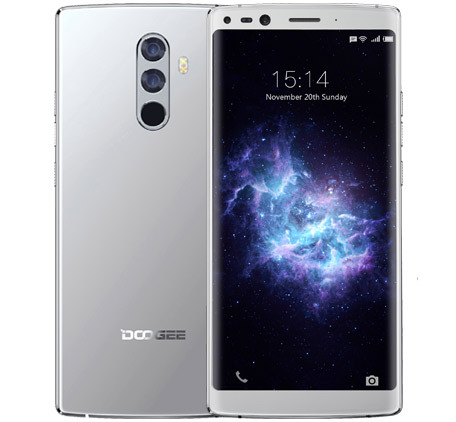 DOOGEE MIX 2 was opened for pre-order, visit the official website and you can get more information about the launch time and price.